“Yeh to gramin kshetra hain. Yaha kuch vikas nahi hua, baaki gramino ki tarah. Na koi transport hain, na koi paani ka suvidha (This is a village. No development has taken place here. Like many other villages, there are no means of transport and no source of water),” complains Balwan Singh, 73, sitting in a tiny salon shop in the Shahpur Garhi village in Narela, which lies in the North West constituency of Delhi. The village, which has about 150 houses, is dominated by the Jat community and migrants who work as labourers in the nearby factories. Singh is one of the oldest people in the neighbourhood and has been staying there for almost seven decades. He used to work in the Ministry of Home Affairs as an assistant when he was young. Now he runs a small general store to pass his time. Shahpur Garhi lies on the outskirts of Delhi. Like the other areas of this constituency, it lacks a transportation system. 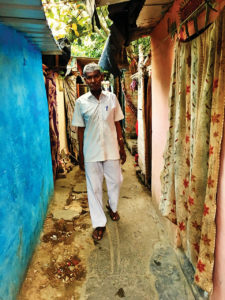 Even though the rest of Delhi is well connected with the Metro, this village is 15 km from the last station of the Yellow Line — Samaypur Badli. “There are some private bus operators, but then we have heard cases of robbery in those buses. And I don’t trust private chota hathi (mini truck for passengers) either,” adds Singh. 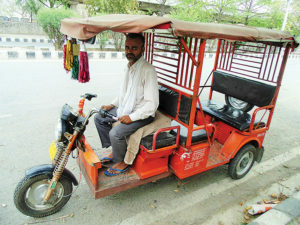 While his son works in DTC (Delhi Transport Corporation) Narela Depot, he thinks that he “cannot ask him to make changes in the service because that will create the impression that he is favouring his area.” His other son works in Delhi Police, while his daughter is a professor in Delhi University. Like the rest of Delhi, areas in North West Delhi constituency also suffer from water-related issues from time to time. In 2018, the city had hit a crisis when the usual peak summer supply — 916 million gallons per day — fell to 851. Areas like Ashok Vihar (North West Delhi) faced severe shortage. In Shahpur Garhi too, water supply “comes for an hour or so in a day. But the quality is so bad, that almost everyone buys filtered water bottles every day,” Singh says. Sanitation is another worrying issue in this constituency. As per the Perceptions Survey 2013 of Institute of Human Development, open dumping of garbage is most prevalent in the North West parts of Delhi and South West Delhi. Right in the middle of the neighbourhood, there is a heap of garbage in a huge open ground. There’s no collection bin, and “the safai karamcharis are least bothered. I have complained so many times to the local parshad (councillor) and the MLA (Member of Legislative Assembly), but they say that these (sweepers) will be transferred. Is that the solution?” Singh questions. The upcoming Chemical Market — part of Delhi Master Plan 2021 — might also aggravate this situation. Being built in a vast open ground, where a number of workers from different construction outfits were seen working tirelessly in the scorching heat. However,though 17 years have gone by since its allotment, little development of the market has taken place. The land comprising of 670 plots (as per the plan) was allotted by DDA (Delhi Development Authority) to the traders of Tilak Bazar in Old Delhi, who were asked to shift to this new site — Integrated Freight Complex. However, there have been reports of traders not being able to identify their land in the absence of markings or signs. A hard-to-find rectangular white board is testimony to this. 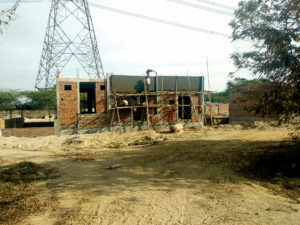 A contractor sitting in front of a plot which is in the construction phase told Patriot that “the construction is taking place at a really slow pace.” There’s no electricity supply yet, just poles. Singh on the other hand, is not too excited about the market and he has a strong reason. “Why are they shifting the market here? People living in this area will get affected by strong pollutants. What about the children living in the area? Delhi is already dealing with rising pollution levels,” says Singh. As per the Delhi Air Quality Index (AQI), on Thursday PM2.5 touched 155 (unhealthy) while others areas of the constituency are also dealing with the same level of PM2.5. His tirade against the chemical market is probably triggered by a sense of loss. 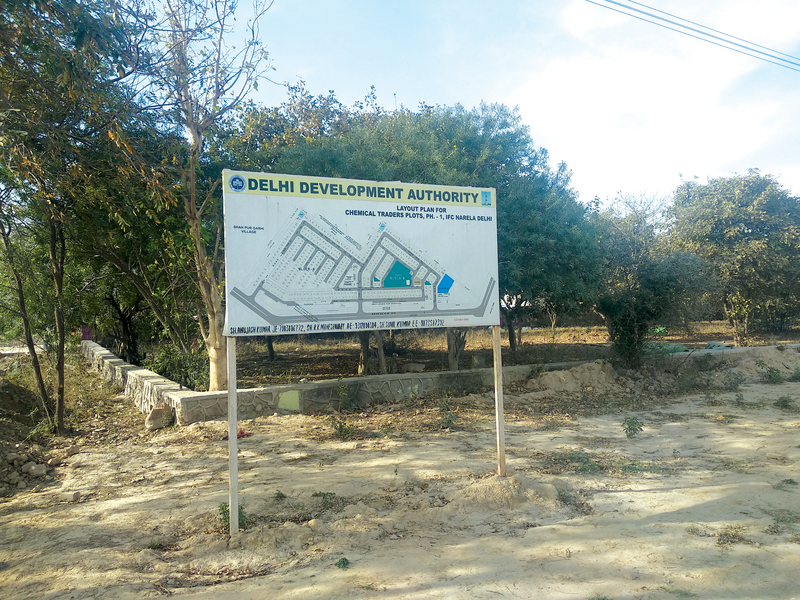 “DDA left us with no choice but to hand over our land, that too at very cheap rates. I sold a huge chunk of my 150 acres of land for some Rs 1 crore in the 1990s. Today the prices have skyrocketed. We call them ‘Delhi Dacoit Authority’,” he adds. He says that many people in the area at that time used to own acres of land and used to farm. But since the DDA took the land under its control, farming has declined over the years. According to Singh, that led to unemployment in the area. “If they’re facing unemployment, they will commit crimes. Back in the days when we had our fields to plough, we used to park our tractors in the fields. Today you cannot even leave a tool there because a kid might sell it to buy food,” says Singh. Not just robbery, Narela is also infamous for missing children. In 2017,as many as 189 such cases were registered, of which 126 were cracked. Narela has also been in the news several times for cases of murder. “We also face a hard time in case of a health emergency. The local hospital is two km away. How will a poor person, who doesn’t even have a cycle, be able to go to the hospital in the middle of the night?” questions Singh. The nearby area — Mangolpuri — gets most number of FIRs registered. Mangolpuri usually stays at the top of the list, which is collated every year by police stations across the city. In 2018, Mangolpuri saw 800 criminal cases, as per a national daily. This is the stark reality of many of the areas which come under the North West constituency. The constituency, which is reserved for the candidates belonging to the Scheduled Castes, came into existence in 2008, on the recommendations of the Delimitation Commission of India. The Congress had won from this constituency in the first Lok Sabha election. 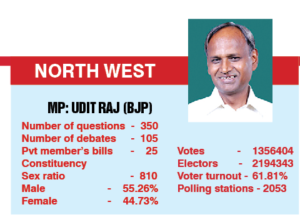 The current MP — Udit Raj — belongs to the BJP. He registered a victory with more than 1,00,000 votes — defeating AAP’s candidate — Rakhi Birla. This year, AAP has nominated Gugan Singh Ranga. As the election draws closer, he says that “I will keep all the scams in mind. Although I have my inclinations, I will vote as per how I feel at that time,” he concludes.